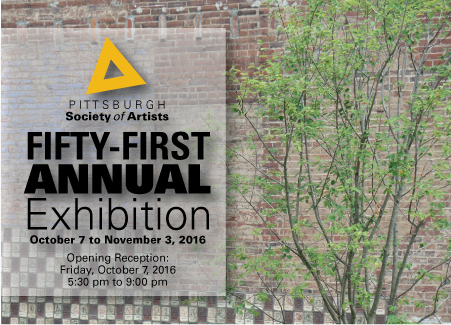 The PITTSBURGH Society of Artists is proud to present our FIFTY-FIRST ANNUAL Exhibition at Harlan Gallery, Seton Hill University in Greensburg. This is a non-themed exhibition that will showcase the very best work of the PITTSBURGH Society of Artists. The exhibition will run October 7 through November 3, 2016. This exhibition is open to all current and paid PITTSBURGH Society of Artists members. Artists may enter up to two pieces for the juror’s consideration. Pieces that have more than one part, such as a diptych, should be priced for the amount of the whole piece. Parts will not be sold separately. Entries can be two or three-dimensional and must be exhibit ready (including all mounting hardware.) Work must be original and new, created within the past year, and not exhibited previously within a 150-mile radius of Pittsburgh.